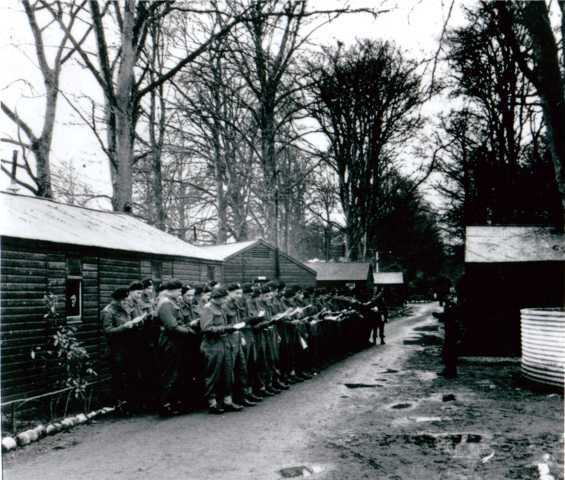 A fine view of the Polish Camp and what appears to be a Service. The date is a guess. Have often wondered, along with others, why the Polish army was based at Invergordon, thought maybe they were there to just protect the harbour. Did some inquiries and found out different. They were the 25th Infantry Division, a unit of the Polish 4th Infantry Division, and finished their training in Northern Scotland. The original plan was to move the division to 21st Army Unit in NW Europe for action there, but with the end of the war the move never took place. The 25th remained in Scotland at Castle Camp Invergordon (interesting I never knew the camp had a name other than the Polish camp). On the gradual demobilisation of the Polish army at the end of the war, many of the soldiers returned to Poland eventually forming a basic unit of the Polish Re-settlement Corps. By then (1947) it was no longer based at Castle Camp at Invergordon. Hi Harry, very interesting info - I always wondered about that too. I never knew the round object in the front right of pic was a water tank, I always thought it was to do with the Mains Farm. I remember it still being there when the Highland games were held there but don't have any reason to go through there now. In case you don't know, the games are now held on the recreation fields after a dispute with the Mackenzie family.